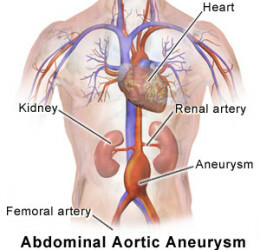 Abdominal aortic aneurysm (AAA) is the third leading cause of death for men over the age of 60. The aorta is the largest artery in your body. It runs through your chest into your abdomen, supplying blood to the lower part of your body. The aorta splits below the navel and carries blood into each leg. Sometimes an area of the aorta becomes weak and expands to the point that it may rupture. A ruptured aorta is a life threatening situation. • Cigarette smoking: This not only increases the risk of developing an abdominal aortic aneurysm, but also increases the risk of aneurysm rupture. • Pain in the abdomen or back. The pain may be severe, sudden, persistent or constant and may spread to the groin, buttocks, or legs. Smoking is a major cause of aortic aneurysm. Studies have shown that the rate of aortic aneurysm has fallen at the same rate as population smoking rates. An abdominal ultrasound is a preventive screening tool that is used to diagnose AAA allowing for prompt treatment. Most aorta aneurysms are asymptomatic. If you have any of these risk factors, discuss with your doctor whether an aorta ultrasound is right for you.